The Marketing mix Template in PowerPoint format includes four slides. 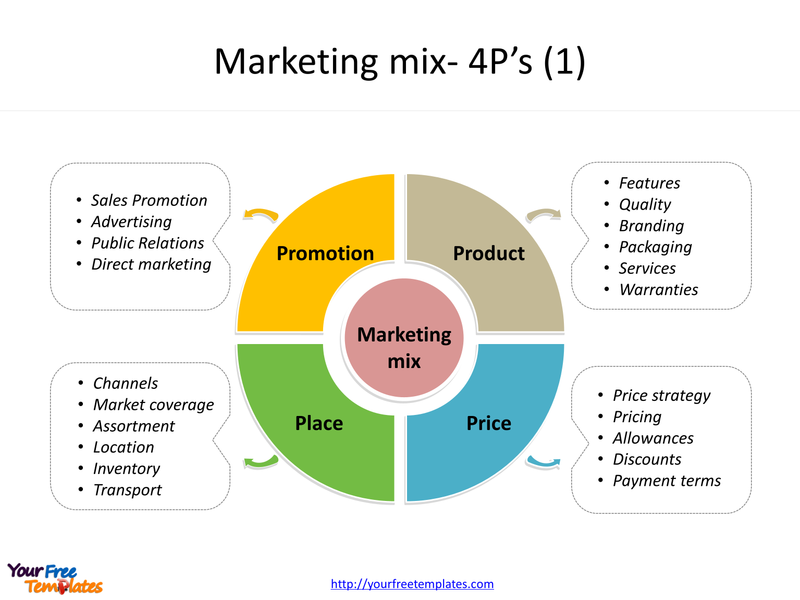 Firstly we have the Marketing-mix in 4P’s formats. Secondly we present Marketing 4P’s strategy in the other 7P’s formats. As the same diagram PowerPoint template series, you can also find our Maslow’s hierarchy of needs, SWOT Analysis, Venn diagram, Data Mining, Machine Learning, cloud computing, Artificial Intelligence and BlockChain PowerPoint templates. The Marketing mix PowerPoint templates include four slides. Slide 1 and 2, Marketing strategy or 4 Ps templates. 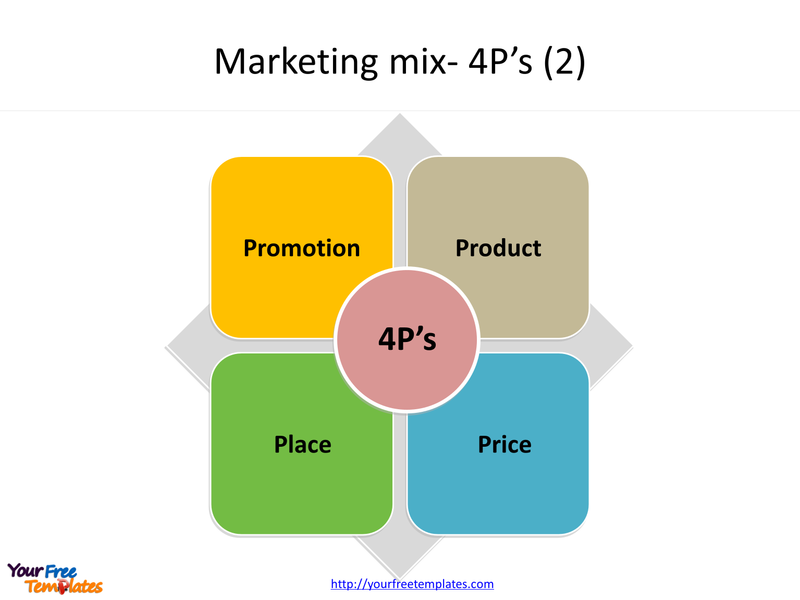 Firstly the marketing-mix (also known as the 4 Ps) is a foundation model. The Marketing 4P’s strategy has been defined as the “set of marketing tools that the firm uses to pursue its marketing objectives in the target”. 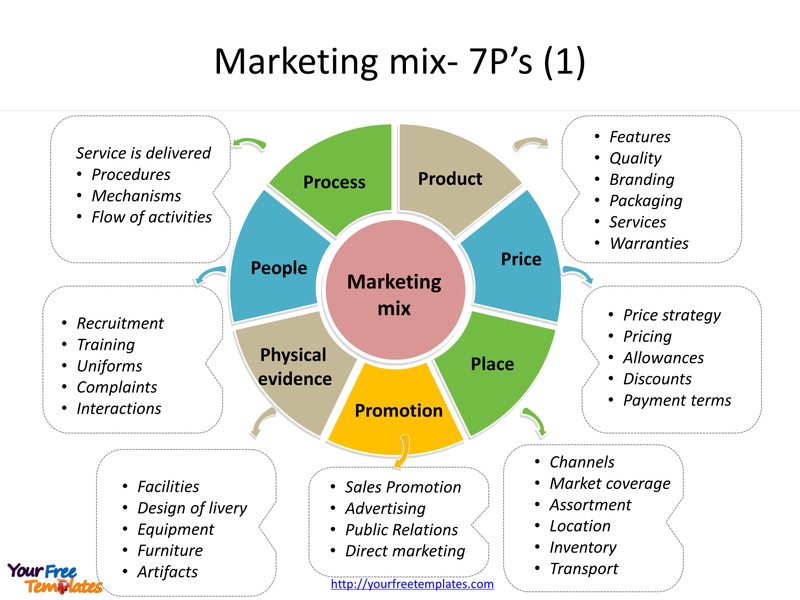 Then the marketing mix refers to four broad levels of marketing decision, namely: product, price, promotion, and place. Finally the contemporary Marketing 4P’s definition, or the 4 Ps, which has become the dominant framework for marketing management decisions, was first published in 1960. A product refers to an item that satisfies the consumer’s needs or wants. Products may be tangible (goods) or intangible (services, ideas or experiences). Price refers to the amount a customer pays for a product. Price may also refer to the sacrifice consumers are prepared to make to acquire a product. Refers to providing customer access considers providing convenience for consumer. Promotion refers to marketing communications may comprise elements such as: advertising, PR, direct marketing and sales promotion. 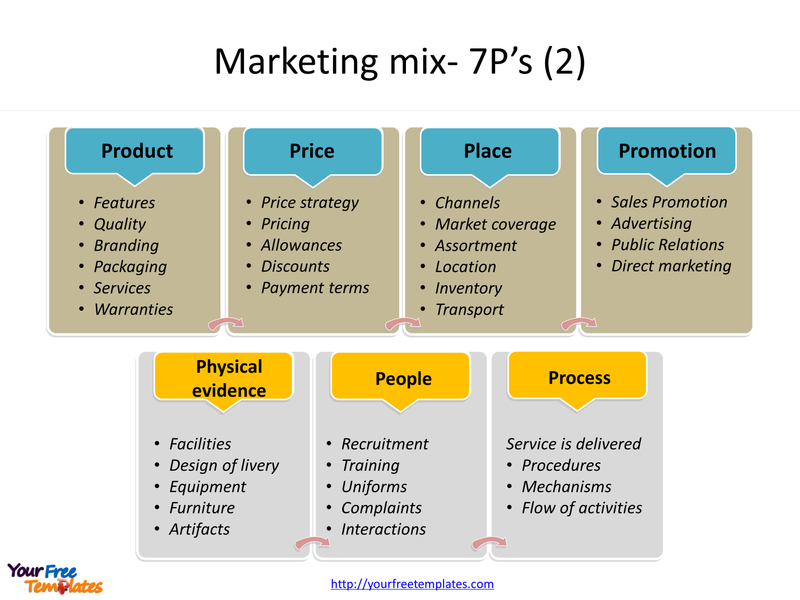 Slide 3 and 4, Marketing mix or 7 Ps templates. In services marketing, an extended marketing mix is used, typically comprising 7 Ps, made up of the original 4 Ps extended by process, people, and physical evidence. Physical evidence —the environment in which service occurs. The space where customers and service personnel interact. People —Human actors who participate in service delivery. Service personnel who represent the company’s values to customers. Interactions between customers. Interactions between employees and customers. Process —the procedures, mechanisms and flow of activities by which service is delivered. 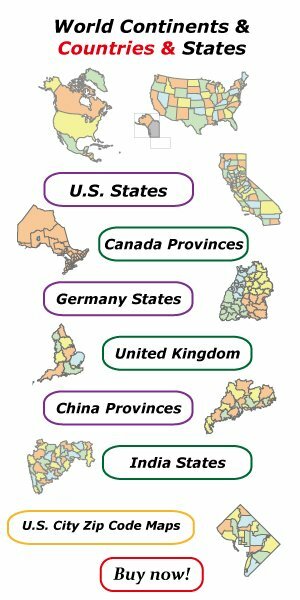 For detailed info on Marketing 7P’s strategy, please refer to Wikipedia.